The 014A, manufactured by Met One, is a three-cup anemometer that monitors wind speed for the range of 0 to 45 m/s with a threshold of 0.45 m/s. You connect the 014A directly to a Campbell Scientific data logger, which measures the anemometer's pulse signal and converts the signal to engineering units (mph, m/s, knots). The 014A is constructed of corrosion-resistant, stainless-steel and anodized aluminum. 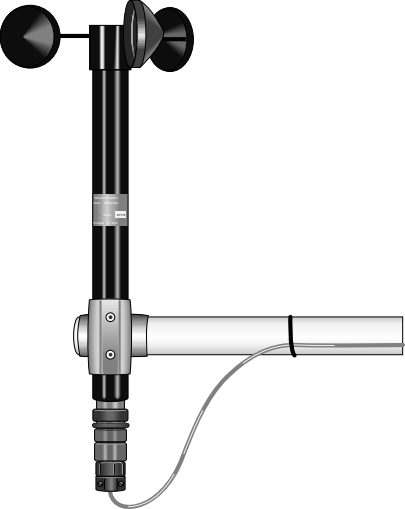 It's three-cup anemometer assembly contains a sealed magnetic reed switch. Rotation of the cupwheel produces a pulse that is directly proportional to wind speed. The 014A attaches to a Campbell Scientific crossarm using a 1049 Nu-Rail fitting or CM220 Right Angle Mounting Bracket. It also can be attached to the top of our CM110, CM115, and CM120 stainless-steel tripods using the CM216 Sensor Mounting Kit. The 014A uses one pulse count channel on the data logger. The 014A is read by the PulseCount Instruction in CRBasic and by Instruction 3 (Pulse Count) in Edlog. Wind speed measurements can be taken and processed with any of the data loggers. Can a replacement reed switch for the 014A-L be ordered? If so, can it be replaced by the user? A replacement reed switch can be ordered. It can be replaced by the user, but Campbell Scientific recommends factory replacement. Is it possible to purchase replacement sensor cables and bearings for the 014A-L? If so, can they be replaced by the user? Replacement sensor cables and bearings can be purchased. They can be replaced by the user, but Campbell Scientific recommends factory replacement. The 014A-L sensors use magnets spinning over a mechanical reed switch to sense wind speed. Eventually the mechanical reed switch will fail and will need to be replaced. Replace both the bearings and the reed switch at the same time. For details on replacing bearings and the reed switch, see Appendix C of the instruction manual.